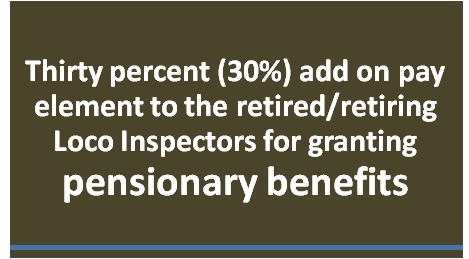 Sub: Thirty percent (30%) add on pay element to the retired/retiring Loco Inspectors for granting pensionary benefits-reg. Ref: (i) Railway Board’s letter No. E(P&A)II-2015/RS-25 dated 24/05/2017. ii) NFIR’s letter No. IV/RSAC/Conf/Part VII dated 28/03/2017 & 07/06/2017. (iii) Railway Board’s letter No. E(P&A)II-2015/RS-25 dated 26/07/2017 to GS/NFIR. (iv) NFIR’s letter No. IV/RSAC/Conf./Pt. VIII dated 27/07/2017, 29/08/2017, 15/09/2017 & 19/09/2017. Federation invites kind attention of the Railway Board to its letters cited under reference and Railway Board’s letter dated 26/07/2017 to NFIR wherein Board wanted to have specific instance where any Zonal Railway has denied 30% pay element for calculation of emoluments for pensionary benefits of any Loco Inspector for taking further necessary action. Responding to Board’ s letter, Federation cited the cases of South Central Railway, South Eastern Railway, East Central Railway and Metro Railway, Kolkata where the Zonal Railways have not taken 30% pay element of 7th CPC pay in respect of retired/retiring Loco Inspectors for the purpose of granting retirement benefits on the pretext that Railway Board’s instructions are yet to be received. Federation is disappointed to note that through a period of nearly ten months has passed, clarificatory instructions have not yet been issued by the Railway Board. Further to above, NFIR desires to state that on East Coast Railway, 11 Senior LIs of Khurda Road Division have also been denied the 30% add on to the pay for pensionary benefits. A specific case of Shri Hari Sarvothama Rao, CLI/Dsl/HQ/SCR retired from service during year 1997 is also cited. At the time of retirement, his Basic Pay was Rs. 11,500 which is equivalent to Rs. 68,000 according to notional pay. Now after adding 30% pay element, the pay comes to Rs. 88,400/2 (pension should be Rs. 44200). But his present pension is Rs. 42,900 which is less by Rs. 1300 per month. 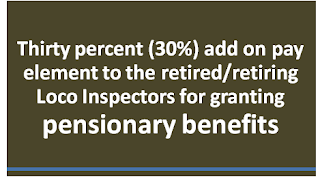 This incident reveals that pension revision is not being done correctly in the case of retired Loco Inspectors. Railways and also to the concerned authority handling the pension portal ARPAN for updating the data issue revised PPOs accordingly to the Loco Inspectors who have been retired prior to 01/01/2016 and after 01/01/2016. A copy of the instructions issued may be endorsed to the Federation.